Why is Jesus’s Genealogy Different in Matthew and Luke? December 22, 2017 7:33 pm / 1 Comment on Why is Jesus’s Genealogy Different in Matthew and Luke? I had the privilege in 2014 of giving the Hayward Lectures at Acadia Divinity School in Nova Scotia. While there I met a young scholar who is working on various topics in the Gospels. His name is Danny Zacharias. He had recently finished a project on the question of why Matthew (ch. 1) and Luke (ch 3) have different names in their genealogies of Jesus. Some point to this as a contradiction which cannot be solved, thus undermining the reliability of the Gospel accounts. Others see the differences as a matter of purpose and focus. Matthew starts with Abraham and moves forward to Jesus to show that Jesus is the true son of Abraham, the embodiment of Israel. Luke starts with Jesus and moves back through Abraham to Adam, demonstrating that Jesus is the Savior of all sons of Adam and daughters of Eve. One traditional “answer” has been that Matthew has Joseph’s genealogy while Luke records Mary’s. Not all, of course, think this is the case. I think you may find it helpful. If so, please let him know. Carey Newman, director of Baylor University Press, recently announced the (re)publication of a number of books under the series title “The Library of Early Christology.” New man, a NT scholar in his own right, has looked over the past forty years at some of the most interesting and influential books published on the earliest Christian assessments of Jesus’ significance. In part these books have contributed to the emerging consensus that an early high Christology originated in the first years or decades of the Jesus movement, most likely in a Jewish context. Carey Newman has taken Baylor University Press from obscurity to become one of the most important university presses in North America. Newman had already published one of the late Alan Segal’s signature books, Two Powers in Heaven (see Hurtado’s article here). The publisher’s page is found here. Wilhelm Bousset’s classic work, Kyrios Christos, has also been republished by Baylor (check it out here) . These are two of the most influential books published on the topic in the past 100 years. Charles A. Gieschen, Angelomorphic Christology: Antecedents and Early Evidence (originally Leiden: Brill, 1998; reprint edition information here). Loren T. Stuckenbruck, Angel Veneration and Christology, (originally, Tübingen: Mohr Siebeck, 1995; reprint edition information here). In addition to this list I must include Larry W. Hurtado’s contribution in this series: Ancient Jewish Monotheism and Early Christian Jesus-Devotion (publisher’s information here). This volume of essays contains some of the “best of” Hurtado over the last 30 years). The Pulitzer Prize-winning novelist Marilynne Robinson is one of the most eminent public intellectuals in America today. In 2016, Time magazine even identified her as one of “The 100 Most Influential People” in the entire world. She is a Fellow of the American Academy of Arts and Sciences and, until her recent retirement, was a Professor of English and Creative Writing at the Iowa Writers’ Workshop, the University of Iowa, Iowa City. Elegant and probing meditations upon the Christian faith often grace her work. Her trilogy of novels, Gilead, Home, and Lila,evocatively and sympathetically present the lives, families, and spiritual convictions of two Protestant ministers in mid-twentieth-century Iowa. Her essays – gathered in collections such as The Death of Adam, When I Was a Child I Read Books, and The Givenness of Things – also recurringly contemplate theological themes. Many of these reflections are grounded in her defiant judgment that the sixteenth-century Protestant Reformer John Calvin still deserves a hearing in the twenty-first century. This conference will offer a memorable opportunity for leading theologians, historians, literary scholars, and church leaders to engage in a thoughtful theological dialogue with both her published work and with Marilynne Robinson herself as she participates fully in this event. There were also be an emphasis on how Robinson’s work can illuminate Christian preaching and ministry, and pastors are warmly invited to attend. The keynote addresses will be given by Marilynne Robinson and Rowan Williams. Do We Need a New Lord’s Prayer? December 10, 2017 9:53 pm / 4 Comments on Do We Need a New Lord’s Prayer? Pope Francis is no stranger to controversy. This week he suggested that Catholics need to re-translate part of the text of the Lord’s Prayer. Now, before you say, so what?, consider that Christians the world over pray the Lord’s prayer weekly in worship and some daily in their personal devotions. It is part of the spiritual heritage of the ages. Now, I realize, I’m limited in this post to the English language and more Catholics around the world don’t speak English than do. But still, it seems, from my limited knowledge of languages, that the idea the Pope is concerned about is reproduced in other western language versions of the Lord’s Prayer. Now let’s see how three major English translations render that line. Four observations. First, most western Christians have memorized the King James Version (KJV). Second, the power of the KJV to shape modern translations should not be underestimated. Even translations like THE VOICE use the same language. Third, the NRSV comes closest to the Pope’s suggestion. Four, modern translations view the prayer as poetic and so render it in poetic verse. The challenge of translation from one language to the next is a significant one. I’ve written about this problem on this site. But with the NT it is even more challenging because we are even further removed from the original source than we might imagine. Jesus spoke Aramaic. The Gospels are written in Greek. And most of us rely heavily on English translations. Now, I think the Pope is onto something to which Christians—Protestant, Catholics and Orthodox—need to pay attention. God does not tempt people to sin. They are tempted by their own desires, or so says James (1:13-15). It seems to me that the prayer of Jesus is similar to Jewish prayers from the same period. They ask roughly the same thing. “God, do not hand your people over to trials and tests, instead rescue them from evil.” In the arc of the Scriptural story think of someone like Job, Abraham (and his near sacrifice of Isaac), and the people of Israel in exile. Whether Pope Francis’ teaching on this makes it down to your average congregation, we will see. If I were a “bettin’ man,” I’d say it will. In the end, no we don’t need a new Lord’s prayer, what we do need is good translations of the one we have. Xmas: Is It Taking Christ out of Christmas? I remember my fourth grade teacher, Mrs. Potts, opening a vein when anyone wrote “Xmas” instead of “Christmas.” She felt there was a war on Christmas and that people who abbreviated the name of the holiday were trying to take Christ out of Christmas. I suppose that is true for some people, but when you look into the real story of “Xmas” you realize that something else is at work. The story begins with the Ten Commandments. One of those commandments says, “Do not take the name of the LORD in vain.” The name by the way is not “LORD,” that was a respectful translation or substitute for the name. In Hebrew THE NAME is four letters, yodh-he-vav-he. The technical term for the name is the tetragrammaton (literally, “the four letters”). Scholars today think the name may have been pronounced—when it was pronounced—Yahweh or Yahveh. But we aren’t sure. This was the covenant name of God, the name revealed to Moses and Israel at Mt. Sinai. The Dead Sea Scrolls provide good evidence for how the name of God was written in the centuries and decades leading up to the New Testament era. In many of the biblical scrolls the name of God is written in paleo-Hebrew script. That would be like shifting to a Gothic font when writing the name of God. In other scrolls the name is not written at all; it is represented by four, thick dots written in the center of the line. In yet other scrolls where the name of God should be there is a blank in the line just large enough for the tetragrammaton. Scholars theorize that the blank was left by a junior scribe and would have been filled in later by a senior scribe who had permission to write the name. Where there is a blank in the line, we think the senior scholar never got around to writing the divine name in the blank. These were some of the ways the faithful showed respect for the name of God. The origin of “Xmas” does not lie in secularists who are trying to take Christ out of Christmas, but in ancient scribal practices adopted to safeguard the divine name and signal respect for it. 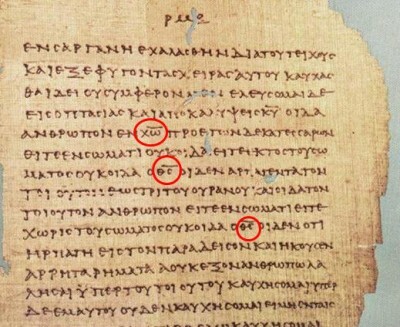 The “X” in “Xmas” is not the English letter (eks) as in “X marks the spot,” but it is the initial Greek letter “Chi” (X), the first letter of the title “Christ.” No doubt some people today use the abbreviated form to disregard the Christian focus of the holy-day, but the background tells a different story, a story of faithful men and women showing the deep respect they have for Jesus at this time of year. Merry Christmas or should I say “Merry Xmas”!